"Absolute ruin. A fallen city is like a dried and decayed corpse; it's a husk that suggests a shape without fleshing out the details. The outline of the victim is there, and the empty holes where it used to look out upon the world... but glass or eye, the critical things that make it alive and breathing are long gone." In an apocalyptic movie, the camera will sweep over once-populated areas, showing what was once a teeming place. Doesn't even have to be in movies, either. Books can do this with a description of "now abandoned structures" or whatever. See also Ghost City, Planet of the Apes Ending, Ruins of the Modern Age, and Scenery Gorn. May feature in Mordor, the Polluted Wasteland, or the Doomed Hometown after its demise. Magnetic Rose and Stink Bomb, the first two parts of Katsuhiro Otomo's Memories. In Magnetic Rose, it's when the mansion's holograms fail and its ruin is revealed. In Stink Bomb, it's when the protagonist sees all the dead animals. What really gets him, though, is how sunflowers and cherry blossoms are in bloom at the same time. Shots like these are played for laughs in many episodes of Megas XLR. Super Dimension Fortress Macross after The Zentraedi destroy most of the earth's surface absolutely revels in shots of cratered, ruined deserts. One particularly memorable shot featured the dessicated, bullet-ridden corpse of a Zentraedi, his severed hand clutching a singing Minmei doll. In episode 22 of Macross Frontier, after the devastating Vajra attack on the Frontier, Ozma and Cathy (on the run after President Glass' murder) walk across a district of the city that was all but razed. There's even an Empathy Doll Shot of a small Ranka doll in Chinese garb. The opening narration to Fist of the North Star. The scene in Elf Quest where Cutter and Skywise return to the burnt out remains of the forest that used to be their home. Incidentally, the scene is drawn in charcoal, appropriately enough - that is, burnt wood. The Walking Dead, a post-Zombie Apocalypse comic book. Y: The Last Man has a couple: one just after the Gendercide strikes, sweeping over several unrelated places around the world (Tokyo Stock Exchange, a farm in Idaho, a football ground in Sao Paulo, and so on); and another when 355 and the new President abandon their car, showing the Interstate highway filled with crashed cars. We get a third much later, seeing West Hollywood's Santa Monica strip (a large center for Gays) reduced to an abandoned and reputedly haunted "Boy's Town" plagued by nihilistic street gangs. Jacques Tardi's It Was the War of the Trenches opens with a large image of an apparently deserted battlefield, all churned mud, wreckage, barbed wire, and shattered trees, looking like nothing living could possibly be there; and then you turn the page and see that there are men huddled in trenches. Old London in Aeon Natum Engel and Aeon Entelechy Evangelion, which gets more desolate which each Herald/Harbinger fight. All the descriptions of post-fall-of-card-games Domino in Decks Fall Everyone Dies are this and sometimes this is played for laughs. 28 Days Later sweeps over London, still and silent, when the protagonist leaves the hospital. Aliens. The colony on LV-426 as the Marines land. The Film of the Book The Andromeda Strain shows the town of Piedmont, New Mexico after the title disease wipes out the population, especially while the two scientists are walking around in their protective suits. The alternate ending to Army of Darkness had a shot like this. 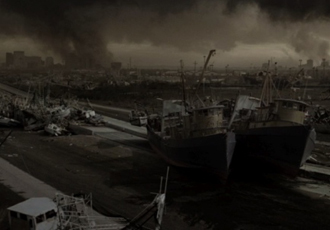 The original Gojira (edited to get Godzilla: King of the Monsters) featured a Desolation Shot of the city after Gojira's attack, complete with destroyed buildings, ambulances, and a choir lamenting the deaths. The Happening. Or st least some trailers of it. I Am Legend and The Omega Man. The Omega Man's shot wasn't entirely desolate, though. Done in the Resident Evil movies Apocalypse and Extinction. Night of the Comet, a comedy about how almost all life on Earth was reduced to red dust by residue from a comet tail. Had a number of shots of buildings and neighborhoods, with the red dust blowing along the ground. The Postman had a few of these, judging from the trailers. The opening of Terminator 2 pans across the devastated Los Angeles. The first Terminator movie does a good job of showing a ruined landscape and a bleak environment for humans. A unique Desolation Shot due to the fact that it's done to the tune of the song Put On Your Sunday Clothes. Juxtaposition ftw. An Italian film dubbed in English despite being filmed in English called Warriors Of The Wasteland had probably the most unintentionally goofy Desolation Shot ever, with burned mannequins in plastic silver armor holding ray guns strewn around the rubble of long-dead cities. Nine absolutely revels in this. The Road has many shots of an absolutely devastated American landscape, to show just how utterly gutted the world is after the mysterious catastrophe. Many establishing shots of Mordor in The Lord of the Rings. Also used for the vision in the Mirror of Galadriel of the corruption of the Shire, which happens in reality in the book but is only used as a warning of the consequences of failure in the film. The opening scene in Patton right after the flag speech shows a desert battlefield. Serenity: Haven. Also, Miranda, which isn't "desolate" so much as "completely gorram empty". The novel version of I Am Legend has one of these somewhat later than the usual placement. The novel The Postman has one of these for the University of Oregon. The Road by Cormac McCarthy is all about this trope. S.M. Stirling's "Emberverse" novels feature quite a few depictions of devastated towns and villages after the technology-destroying "Change." The Fall of Coruscant in the New Jedi Order provided ample opportunity for these, including sequences throughout the Enemy Lines duology about a recon team returning to the ruins. There was an episode of Star Trek: The Next Generation that began in a thriving small town on a pastoral planet. Then the Crystalline Entity showed up and destroyed everything. There's a shot panning right across the desolate, smoking landscape, with Riker in front of it, looking at it. Cut to opening credits. Also done in Part 1 of "The Best of Both Worlds", showing the remains of a colony after a Borg attack. The remains are a mile-wide crater. In another episode, there is a disturbing shot of a devastated planet, a former Federation colony, with exactly one undamaged house surrounded by a square of perfectly manicured grass. The plot is our heroes' attempts to remove the residents of that house from that planet. Interestingly, that view came from above: there are no desolation shots from the house. Pretty much all of the documentary and spinoff series Life After People is composed of shots like this, since it's showing the decay and eventual collapse that major cities will undergo if humans disappeared from the face of the Earth. Heavily done in Stargate Atlantis, since the Wraith obliterates any world that resists them. The video for 'Sing for Absolution' by Muse features a dusty, barren planet that's revealed as Earth when the camera angle changes to show the Houses of Parliament in ruins. The whole of Cannon Fodder is one long Desolation Shot. Fallout's intro movie has this, as does the intro for Fallout Tactics. The trailers for Fallout 3 do it as well. Final Fantasy X has a memorable one when the group finally makes it to Zanarkand. The intro to FreeSpace 2, after the battle flashback, is a series of incredibly depressing Desolation Shots followed by a Crowning Moment of Awesome featuring a huge Terran-Vasudan fleet led by the GTVA Colossus. G Darius does this twice. The first is the route Zeta opening; your craft passes a doomed space colony crushed by debris. The insides look very pretty until it's torn up bit by bit. The real one comes in route Omikron opening (final stage, G.T. 's route). Your craft fights in a darkened area with rain effects. However, every once in a while, lightning lights up the area. The spectacle is filled with sunken buildings, roads, infrastructures, etc., culminating finally in a shot of G.T. itself. To further drive the point home, the stage name is Grave of Cultures. In the intro Cutscene to the first Halo game's last level, you see how Halo has been turned into a desert wasteland by the Flood. In Halo 2, you see a Flood-infested High Charity. Resident Evil. RE:O has a shot of a street visited earlier by the survivors; despite the zombies eating people, all there is are burning buildings and wrecked cars. R-Type Final does this, starting with a pan over a crashed space colony. Indeed, the title screen does it too, showing the control rods of a Force Device jutting out from underwater, implying that the player's ship won't survive the game. Happens in the end of Sonic Adventure, right before the final boss battle with Chaos. Also in the 06 game, panning over Crisis City. "Dancing on the ashes of the world, I beheld the stars..."
Half Life 2: Episode One is deliberately set up with these types of shots to highlight the devastation of City 17 in the wake of the Combine Citadel's destruction. Similar shots are used again in Episode Two, to highlight the second and much more destructive explosion. Any time the PC of Dragon Age is in the Deep Roads you get this, not necessarily a sweeping shot but you're still standing in the ruins of a once great empire. In The Legend of Zelda Ocarina of Time, there is a panning shot of what used to be Hyrule Castle but has been destroyed by Ganondorf and made into a desolate wasteland. The Earth portions of Mass Effect 3, most prominently including an exploding human dreadnought. Also, the view from Menae (a moon of Palaven, the turian homeworld) of Palaven visibly burning—Garrus even mentions that one particularly large firestorm was his home city. In the 2008 version of Horton Hears a Who!, a very chilling one occurs of Whoville after Vlad drops it. A very sad contrast to the lively, carefree world it was not half an hour earlier. Don't worry though. The Whos are just hiding. As if they would really kill the Whos. The earlier featurette was even more severe; the city had literally been reduced to rubble, and the Whos crawl from it singing a sad song about how they wish they had listened to Dr. Who-bee's warnings. Doc: Dead Man's Desert sure has some strange formations. Niko: All this was suburbs once. Millions of Tortunans lived here. Doc: What happened to them? This page was last edited on 21 February 2018, at 21:58.